Roughly 600 New Yorkers joined immigrant advocates near Trump Tower to call on President Trump to keep the Deferred Action for Childhood Arrivals program for undocumented youth and the Temporary Protected Status program for people from countries experiencing humanitarian crises. So far, the Trump administration has not rescinded DACA, a program started by former President Barack Obama in 2012 that applies to undocumented individuals who came to the United States before their 16th birthday, were under the age of 31 before 2012, have not been convicted of a felony or significant misdemeanor and are in school, graduated from school or have been honorably discharged from the Armed Forces of the United States. But last June, attorneys general from 10 states — Texas, Louisiana, Alabama, Nebraska, Arkansas, South Carolina, Idaho, Tennessee, Idaho, West Virginia and Kansas — sent a letter to U.S. Attorney General Jeff Sessions requesting that the administration terminate DACA by Sept. 5, which is 21 days away, or they will move forward with a lawsuit currently pending in the Southern District of Texas. About 800,000 young people stand to be at risk of deportation if the Trump administration ends the program. Temporary Protected Status has provided more than 350,000 people relief by granting them work permits and allowing them to live in the United States without the threat of deportation. The Department of Homeland Security has not said directly that it will continue the program. 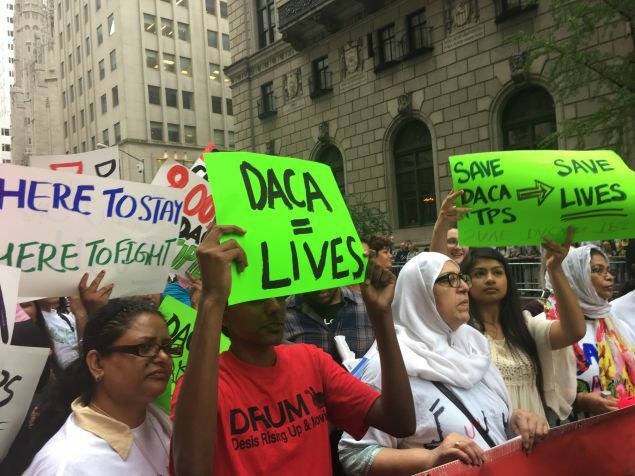 Coinciding with the fifth anniversary of DACA going into effect, advocates and other New Yorkers rallied by Trump’s headquarters as Trump was visiting the city. Angie Kim, a community organizing fellow at the MinKwon Center for Community Action reminded the crowd that programs like DACA and TPS came to fruition because of their tireless advocacy. “We are here because programs like DACA and TPS were only made possible because of the organizing that impacted communities,” Kim said. She noted that her activism began with DACA and said that they all worked together to make it happen. Participating organizations included the New York Immigration Coalition, Desis Rising Up and Moving, the MinKwon Center for Community Action, Yonkers Sanctuary Movement and Columbia County Sanctuary Movement. DACA recipients, TPS recipients and other immigrant New Yorkers also shared their experiences during the rally. Public Advocate Letitia James also spoke at the rally. Gloria Martinez, one of the co-founders of the Columbia County Sanctuary Movement, a multicultural organization that supports immigrants in Columbia County, N.Y., co-coordinaes the group’s Community and Family Support Committee. Martinez is the first of her Salvadorian family to be born in the United States. She recounted her mother’s negative experience with a U.S. Citizenship and Immigration Services officer, who took away her passport during her last appointment and warned that she could be deported to El Salvador. DACA recipient Stephanie Ji Won Park, an Immigrant Justice Corps community fellow at the Minkwon Center for Community Action who came to the Bronx from South Korea with her family when she was five years old, said that she was initially afraid to share her experience as an undocumented individual. “Though my story and personal struggles are not unique, I want to reinforce the idea that each and every one of our personal stories is powerful and is meaningful,” Park said.